We are thankful to those community members that have made donations. Your giving spirit reminds us of how much we have to be thankful for at NES. Last year, the NES PTA spent roughly $75.00 on each student. We appreciate your ongoing donations to help us continue offering school grants, enrichment activities and family events that otherwise wouldn’t be provided for in the regular school budget. We are a non-profit organization. Your tax-deductible donations are much appreciated. 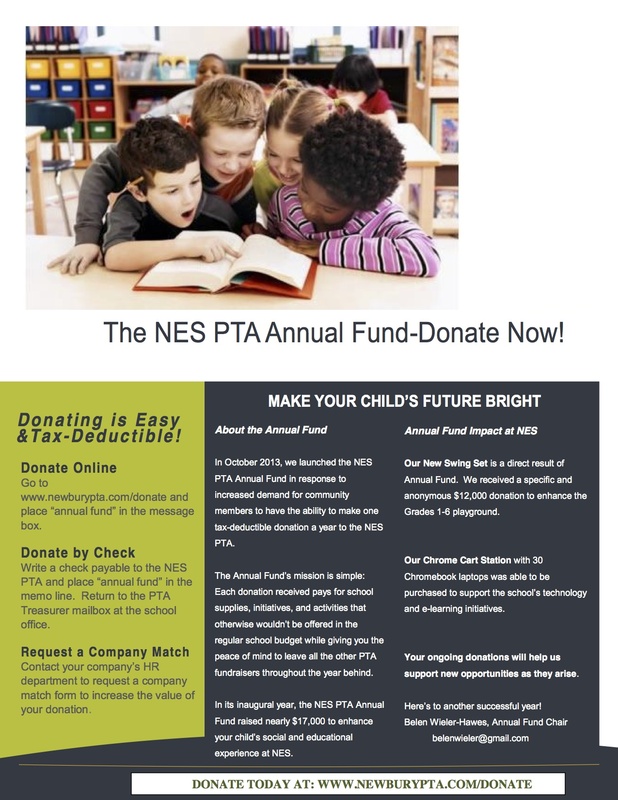 To donate by check, make the check payable to the NES PTA and enter “ANNUAL FUND” on memo line, and return to NES Treasurer in the school office! OR You can donate right now using Paypal by clicking on the button below. Please add “ANNUAL FUND” in the “Add special instructions to the seller” section. Does your employer match donations? You’d be surprised at how many do! See your HR department for the forms to match your PTA donations dollar for dollar. Some employers even match your volunteer time with cash for your school! Email newburyPTAinfo@gmail.com for more information; we can guide you through the process.